Hull weight (approx. ): 190 lbs. 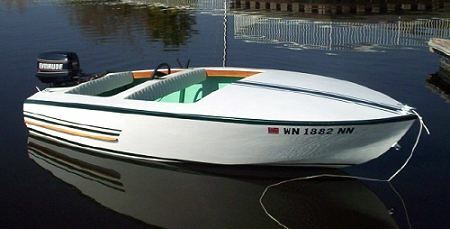 Power: Short shaft outboard motor to 25 hp. Long shaft motor can be used if transom modified. Can the hull be extended or shortened? Lengthen: Yes. Shorten: No, up to 10% by re-spacing the frames from the aft end of the stem to the transom a proportional amount. We do not recommend increasing the beam.